It is July 1997. I have decided to move back to Gainesville, Florida in a few weeks. I also decide to try to squeeze in as much of Colorado as possible before I leave. Over the past month, I have paraglided off of the foothills, enjoyed an overnight hike to Fern Lake in Rocky Mountain National Park, and hiked most every trail in the Boulder foothills. But I had still not engaged in whitewater rafting in Colorado. After doing some research, I discover that the Arkansas River seems to fit the bill. It is the second most popular whitewater river in America (behind the American River in California), very scenic, and contains some relatively challenging whitewater (especially the Class IV Royal Gorge). I am eager to sample the river, in part because we had a large amount of snowfall this past winter season and the rivers were still running high when I make reservations for mid-July. Still, it has gone down dramatically to 1,500 CFS since May and June, when it was running over 4,000 CFS. Before the trip, I joke with the friends who would go with me that we would need to bring body bags "just in case." After all, 38 lives have been lost on this river from 1990 till 2004, making it the most deadly of the commercially-run rivers in America. 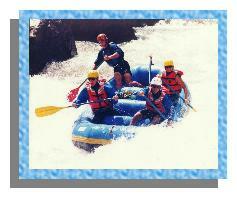 The photo to the right shows my group barreling through the Arkansas whitewater. The put-in for our raft is a 2 & 1/2 to 3-hour trip south from Boulder. Due to the dry desert climate in Colorado, we have excellent rafting weather. For most of the trip, we enjoy the fantastic red rock canyon walls along the river banks. In fact, the Royal Gorge features 1,000-foot high vertical walls that narrows the river down to about 3 or 4 boat widths at certain points. Above us in the Gorge is the world's highest suspension bridge (we wonder if they had to use a harpoon to originally put up the bridge lines). At the beginning of the trip, and at our lunch stop just before the Royal Gorge rapids, we are given a lot of detailed instructions about how to paddle, how to float if you fall out of the boat, and what to expect along the way. This, combined with our need to wait at lunch for another raft to show up from the company office to follow us through the Gorge in case we are (unceremoniously) dumped, makes for a worrisome for me. I begin to think to myself that I want to get this over with instead of waiting all this time for my doom. Fortunately, our rafting crew is skilled enough so that we make it through all the rapids without anyone "going for a swim" or having the raft flip over. Our guide (Shane from Clear Creek Rafting) barks out instructions loud and clear, and is skilled at steering the raft to avoid danger. My two friends (there were four of us in the boat) are also quite good. As a result, while we find ourselves entering many of the numerous "holes" on the river (the river is filled with these treacherous spots that often trap a boat and dump people in the raft), we handle them well. The exciting rapids we do this day are Shark's Teeth, Sledgehammer, Boat Eater and Lower Boat Eater, Get Ready Get Set Go!, Guide's Revenge, Puppy Tail, Grateful Dead, and Sunshine (probably the most challenging rapid in Royal Gorge).